The legendary tower of the Protestant church is considered the landmark Grötzingens. The significant rotation of the spire and the cheerful colors of encaustic tiles attract a lot of attention. According to legend, the devil would upset the Church, but failed because of the strength of the faithful. Now, what is really responsible for the rotation? Did the skillful builders so reminiscent of the crossing tower of the monastery Weissenburg or the rotation goes back to a fault or damage in the rafters? The experts are divided. 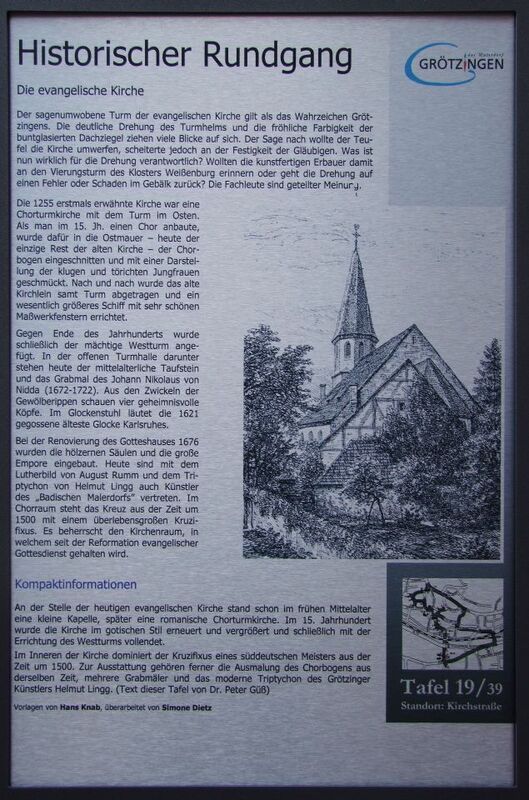 The church was first mentioned in 1255 a choir tower with the tower in the east. . The chancel arch incised and decorated with a representation of the wise and foolish virgins - as one in the 15th century a choir grew, it was in the east wall - Today the only remnant of the old church. Gradually, the old church was demolished, including towers and built a much larger ship with beautiful tracery windows. Towards the end of the century finally the mighty west tower was added. In the open tower hall including today are the medieval baptismal font and the tomb of Johann Nikolaus von Nidda (1672-1722). From the spandrels of the arch ribs look four mysterious heads. In the belfry ringing the 1621 cast oldest bell Karlsruhe. During the renovation of the church in 1676, the wooden pillars and the large gallery was built. Today, artists are represented "Badische painters village" with the image of Luther August Rumm and the triptych of Helmut Lingg. In the chancel is the cross dating from around 1500 with a larger than life crucifix. It dominates the church, in which since the Reformation Protestant service is held.